For my first Friendly Friday I'd like to introduce my friend Kellie Keck who is, by all accounts a true make up maven. Kelly lives this crazy fabulous life and makes her living by making others look their best. For six years Kelli has been honing her craft of make up artistry. In addition to regular make up Kellie is also skilled in airbrushing. One look at her portfolio will impress you. She’s done substantial work on not only brides, but on photo shoots with professional models and celebrities. Her work can be seen in national print and television ads. Not only is she super skilled she is also super sweet and really fun. Kellie was happy to share a little bit of Q&A with me. Me: What are the benefits of having makeup professionally done on a special occasion? Ms. Keck: There are many benefits and to name just a few: If you have your makeup professionally airbrushed you will have that flawless look that will last all day and isn't cakey. No one should have to feel their makeup and airbrushing is very lightweight. 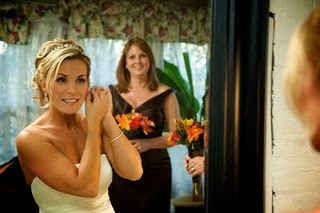 Having a professional makeup artist do your makeup also insures that you look your best. An artist can really bring out your best features and help you to feel even more confident and less stressed. Once you have your makeup professionally done it is hard to imagine a special event without a makeup artist on your team. Me: What is your favorite part about doing wedding makeup? Ms. Keck: I love gettin g to know my brides. Everyone is so unique and has a story so spending that time doing the makeup and getting to know my brides is incredible. It is also very rewarding when I am able to really take the stress away from a bride by covering up a breakout or something similar. It may sound silly but after a bride has spent all of that time planning the wedding and all of the money for photography not to mention getting ready to walk out in front of all her family and friends if a breakout occurs overnight (which it often does) that can cause some serious stress and anxiety. 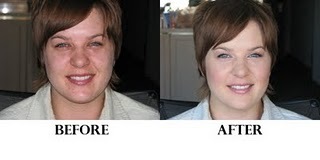 It is great to be able to come in that morning and airbrush it all away and help her to feel confident and relaxed again. Ms. Keck: I really enjoy the getting ready part of the morning. There is such a different energy in the morning. The bride is gathered with all of her bridesmaids and family and everyone is having a good time laughing and sharing stories. it makes me smile to see that girlie bonding and fun! Me: Any important info you'd like to share with the brides who visit my blog? Also, for weddings in Jan and Feb I am offering a huge discount of 50% off our package prices. Please email for more info on those also. Me: As a makeup maven, what is your favorite product? Got a fave liner, shadow or product you can't live without? Ms. Keck: I am such a makeup junkie! I do have some favorites though. I can not live without eyeliner and I go back and forth between a gel liner and a kohl liner. MAC Fluidliners are great gel liners and the Kevyn Aucoin pencil in Basic Black is my favorite pencil. I also love NARS blushes (all of the colors are amazing), Chanel eyeshadows and one of my favorite lip colors is Hue by MAC. Me: Since Christmas is coming do you have a favorite X-mas tradition, recipe, hint, tip? Ms. Keck: Christmas is my favorite time of the year. I especially love walking around the mall even if I am not shopping. The window displays are always so festive and people are generally in a good mood. I am LOVE all of the eating! Food around the holidays is guilt-free in my book. I have a great recipe from The 5 in 10 Dessert Cookbook: 5 Ingredients in 10 minutes of Less. What I love about this recipe, other than how easy it is, is that with all of the other holiday food this is a nice surprise. It is still chocolately and the cookie dough is right at home with holiday food but then the strawberries just add a freshness and lightness to it. It never lasts through the night! 1. Preheat the over to 400 degrees. Cut the cookie dough into 1/4-inch slices. Place in a foil-lines 14-inch round pizza pan with a 1/4-inch high rim. Press together to form a crust on the bottom. Bake for 8-9 minutes, or until golden. 2. Meanwhile. in a 2-cup glass measure, combine the chocolate chips and cream. Microwave on High for 1 1/2 minutes, or until the chocolate is melted and smooth when stirred. Stir in vanilla. 3. Rinse, drain and hull the strawberries. Cut in half lengthwise. 4. Spread the chocolate cream evenly over the baked crust. Beginning at the edge. arrange the strawberries on the "pizza" in concentric circles, cut side down and with the points toward the outside edge of the pan; cover the chocolate completely with berries. Refrigerate until set, at least 20 to 30 minutes. Thanks again to Kellie for sharing with us! I hope those of you with a special event in your future will consider giving a Kellie a call and take advantage of her fabulous specials going on.